As winter sets in at Titan’s south pole, a cloud system called the south polar vortex (small, bright “button”) has been forming, as seen in this 2013 image. 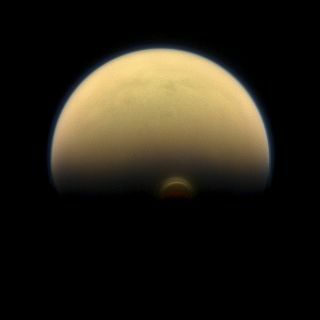 NASA's Cassini spacecraft has detected a massive, never-before-seen icy cloud at the south pole of Saturn's huge moon Titan. The newly spotted feature — part of a cloud system known as the south polar vortex — suggests that winter in the southern hemisphere of Titan will be even colder than predicted, scientists said. Anderson presented the new Cassini results at a news briefing Nov. 11 at the 47th annual meeting of the American Astronomical Society's Division of Planetary Sciences in Oxen Hill, Maryland. She also spoke at the morning session of the conference that day. But Titan's seas are composed of ethane and methane rather than water. Many scientists regard the moon as one of the solar system's best bets to host alien life, though any indigenous Titan organisms would have to be quite different than the kind that evolved on Earth. Titan also boasts clouds in its dense atmosphere. Some of these lie close to the moon's surface, while others sit higher up in its sky. In 2012, scientists determined that the top of one of Titan's clouds sat at an altitude of about 186 miles (300 kilometers) above the moon's south pole, up in the stratosphere, a stable atmospheric region above the active weather layer. "That cloud is just the tip of a more extensive stratospheric cloud system that has been building up for a little bit of time now, we think, as Titan heads into its southern winter," Anderson said. A second enormous cloud was only recently spotted lying much lower in the atmosphere. Scientists investigated that cloud's composition using Cassini's Composite Infrared Spectrometer (CIRS) instrument, and by performing laboratory experiments under Titan-like conditions. "This cloud is new and separate," Anderson said. But it's a different story around Titan's poles. There, atmospheric circulation moves gases from the warmer, spring hemisphere (currently, the northern hemisphere) to the colder southern one. When the gases reach the cooler region, they sink, encountering even colder temperatures on the way down. While some gases rain out, others freeze into layers over different heights, scientists said. Cassini arrived at Saturn in 2004 — midwinter for the north polar region and midsummer for the south. Each of Titan's seasonslast about 7.5 Earth years, so the moon's southern reaches are now just beginning to transition from fall to winter, and will still be locked in winter's chill when the Cassini mission ends in September 2017. Ice clouds around the north pole have been disappearing as spring arrives, while new clouds have been forming at the south pole. The overall change indicates that the direction of Titan's global circulation is slowly shifting, researchers said. According to Anderson, the colder temperatures mean that southern winter on Titan "is coming on strong."